The trails along the ridge served by the Silverlode Chair are moderately steep but smooth. The new Iron Mountain expansion provides excellent cruising with minimal crowding. There is a lot of steep terrain; the trails between Wasatch and Sultan are a great mix of steep groomed runs and interspersed bump sections. 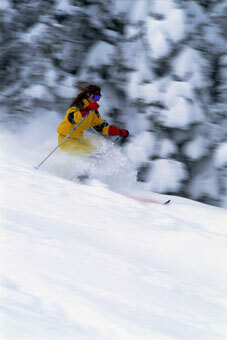 Don�t overlook the �Ski Team� trails on the front of the mountain � Willy�s Erica�s Gold, Silver King, and Crescent. 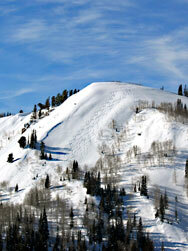 There�s a lot of great skiing frequently overlooked, on the north side of the Condor chair. Two feature areas at Deer Valley for thrill-seekers, both in Empire: the Daly Chutes from Empire chair, and Centennial Trees from the Lady Morgan chair. Steep chutes in Jupiter: Portuguese Gap, Six Bells, Silver Cliffs, and other steep tree shots. Don�t miss Scott�s Bowl. Without climbing, the bowls north from 9990. Also, there are abundant steep trees in various places at Canyons. Alta has a lot more cruising and beginner terrain than is generally appreciated. The Albion Basin is a popular novice/intermediate area of great scenic appeal. Skiing on the beginner lift is free after 3PM. Snowbird has a bit less to offer beginner skiers / riders, but there really are a lot of runs and bowls for the less experienced. Snowbird should not be overlooked, and the scenery is spectacular. Solitude needs a pretty thick cover of base before being truly skiable, but when it does, it offers terrific powder skiing, especially in Honeycomb Canyon, now served by an individual lift. Also, the grooming is excellent, and the terrain has lots of rolls and features; this is a great area for cruising skiers / riders. Brighton has the greatest night skiing in the state, and the terrain parks rival Park City in popularity; this is a hidden, uncrowded gem. 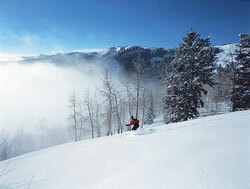 On powder days, the Wasatch Crest high-speed chair provides deep powder skiing much longer than the other resorts. Snowbasin is just a bit over an hour, and a very scenic drive, from Park City / Deer Valley. The lodges rival Deer Valley in opulence. This is an excellent area for all members of the family, as there is both steep and challenging terrain on the west side of the resort, including the 2002 Olympic downhill runs, and low-angle, easy cruising terrain on the east side.